HOUSTON, Friday, Feb. 5 1971 —Two astronauts of Apollo 14—the fifth and sixth human beings ever—landed on the moon early this morning. Capt. Alan B. Shepard Jr. and Comdr. Edgar D. Mitchell of the Navy steered the four?legged landing craft named Antares to a smooth touchdown at 4:18 A.M., Eastern standard time, on the moon’s highlands. Their landing, the third made by American astronauts, came after a four?day, 250,000?mile voyage across the void of space. It came a year and a half after man’s first landing, Apollo 11’s pioneering visit to the Sea of Tranquility. 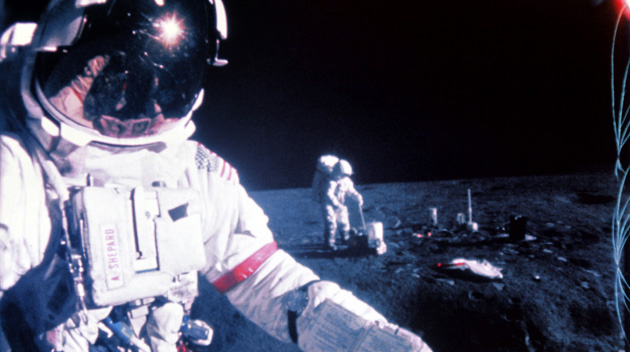 The four other men on the moon were Neil A. Armstrong, the first to set foot on the lunar surface — on July 20, 1969 — and Col. Edwin E. Aldrin Jr. of the Air Force, from Apollo II, and Comdr. Charles Conrad Jr. and Comdr. Alan L. Bean of the Navy, from Apollo 12. The Apollo 14 astronauts brought their 16?ton landing craft down on a fairly level valley in the Fra Mauro highlands, a cratered and rockstrewn area where the astronauts should be able to find rocks as old as the solar system itself. They plan a 33½hour visit. While Maj. Stuart A. Roosa of the Air Force was scheduled to pilot the command module Kitty Hawk in a watchful orbit overhead, Captain Shepard and Commander Mitchell would take two long excursions outside their landing craft to set up a nuclear?powered scientific station and get rock samples. The first of their moon walks, which would last up to five hours each, was to begin around 9 AM. today. Captain Shepard would take the first steps down the ladder, followed a few minutes later by Commander Mitchell. All their activities should be seen on earth through a color television transmission from Antares. The second moon walk, scheduled for early tomorrow morning, also was scheduled to be televised. At 11:51 P.M., on Apollo 14’s 12th revolution of the moon, Antares and Kitty Hawk separated. The docking mechanism that had given the astronauts trouble early in the flight unlatched without flaw. Major Roosa then fired maneuvering rockets on the command ship and moved back to a safe distance, flying higher than Antares. Later at 1:10 A.M., Kitty Hawk’s main rocket fired a short burst to gather speed and move into a more circular orbit, about 70 miles above the moon. At that altitude, Kitty Hawk was in a favorable position to link up with Antares after its return from the moon. As Kitty Hawk moved away, Antares followed an orbit ranging from about 69 miles on the far side of the moon to about 10 miles as it passed over the landing path. For the final descent, following a long, curving trajectory from 10 miles to touchdown, Captain Shepard and Commander Mitchell needed an 11?minute firing of the rocket in the lunar module’s lower stage. The descent was carefully plotted by radar, computer and the experienced eyes of the astronauts. A problem with mysterious abort signals in the guidance computer on Antares caused concern as Captain Shepard and Commander Mitchell prepared for the landing. Strange signals monitored on the ground indicated that an “abort command” was showing up in the computer, perhaps because of contamination in the abort switch. If this had happened during a lunar?module rocket firing, it would have caused an unintentional abort of the lunar landing. Consequently, mission control gave the astronauts a new set of instructions to be fed into the computer immediately after the descent rocket firing was begun. The new procedure would, in effect, tell the computer to ignore such an unintentional abort signal. The astronauts got about six hours of sleep during a 10?hour rest period before their long and critical night began. At about 9 o’clock last night, Captain Shepard and Commander Mitchell donned their heavy space suits, opened the hatch and crawled through the connecting tunnel into the attached lunar module. One of their chief concerns during the inspection tour, was the condition of one of the two storage batteries in the lunar module’s ascent stage. When it was tested two days ago, it was found to have lost about three?tenths of a volt from its level at liftoff. Had it further degraded, indicating problems in more than one cell, flight controllers would have had to call off the landing attempt. Apollo 14 reached lunar orbit early yesterday morning and by 9 P.M. had looped the moon 11 times, traveling at a speed of about 3,500 miles an hour. Each time Apollo 14—the combined command ship and lunar module—swung around the face of the moon and swooped down to within 10 miles of the surface, the astronauts could see the rugged features of Fra Mauro. It was early dawn at the time there, giving the astronauts the ideal lighting conditions for their landing. Their arrival was timed so that the astronauts would have the sun low on the horizon and behind their backs as they made the tricky descent to the moon. The hills of Fra Mauro rise along the eastern rim of the Ocean of Storms, just south of the lunar equator. The landing area is about 110 miles east of where Apollo 12 touched down in November, 1969. The precise landing target was set in a narrow valley between two clusters of craters that the astronauts nicknamed Triplet and. Doublet. Some of the nearby hills and ridges rise as much as 8,000 feet high, seemingly even greater than a similar elevation on earth because the moon is roughly one?fourth the size earth. Scientists believe that on this rugged terrain is material dating back 4.6 billion years to the creation of the moon. Analysis of the samples could determine much about the processes of the moon’s origin. The goal for the first walk was to deploy instruments to record moonquakes, to measure electrically charged particles on the lunar surface and to collect imprints of solar particle bombardment. The nuclear?powered scientific station was designed to operate more than a year. The Apollo 12 seismometer is still returning data. On the second walk—EVA for extravehicular activity—the objective was hiking to a feature known as Cone Crater. The crater is situated at the top of a gentle hill that arise: about 330 feet above the relatively level landing site. Rocks around the lip of the crater are thought to have been tossed there from the impact that formed the crater. They would thus come from much deeper inside the moon than any samples previously returned by astronauts. Getting into position for the landing attempt took a two?step maneuver. First, the Apollo 14 astronauts fired the spaceship’s main rocket to swing into a wide looping orbit of the moon. After two revolutions, they refired the same rocket, which is at the stern of the spaceship, to lower the orbit. Both rocket firings cut off fraction of a second early, but that did not significantly throw the spaceship off its intendedi orbit. In the lower orbit, Apollo I dipped as low as 12 miles fro the surface over the front ski: and then swung out to about 67 miles high while over the far side of the moon. On previous missions, the lower orbit was achieved by the lunar module’s descent rocket after the two ships had separated. The change on this mission’ saved enough lunar module fuel to allow the astronauts an additional 15 seconds to hover at the last moment before touchdown. While orbiting the moon, awaiting the landing attempt, he astronauts described the desolate world they saw below. “It looks like a plaster mold that somebody has dusted vii grays and browns.” Commander Mitchell radioed. This entry was posted in Uncategorized and tagged 1971, 5 February by Admin2. Bookmark the permalink.